The Dom Buckley Motorsport team headed to North Wales for their first event with Brian Bell since the Dukeries Rally in October. Not only was that nearly 6 months ago but it was also a Tarmac rally. Brian has teamed up with experienced co-driver, Jamie Edwards for 2016 but will drive the same Ford Focus WRC he used in 2015. A test was organised for Friday morning for Brian and Jamie to get up to speed and to give the car a run out after its rebuild over the winter. The team were greeted at the Sweet Lamb Complex with dry conditions and completed around 30miles of testing gaining some valuable information on tyre choice and getting back into the swing of things ahead of the rally on Saturday. After a quick wash over and a good spanner check the car was taken through all the pre event checks by the organisers and scruitineers and was ready for action. An hours drive from Sweet Lamb and 24 hours later from the test and the conditions could not have been any different. A constant heavy downpour was heard throughout the night and this would not ease off until the cars headed for the finish ramp. Stage one was classed as a disaster but through no fault of the driver or the car. Unfortunately the rear left tyre popped of the rim around 4 miles from the end of the stage leaving Brian no real option but to drive to the end of the stage with the puncture thus seeing them lying 28th overall. Not disheartened though, the Bell Leisure Ford Focus WRC was soon back to full fitness when the driver and co-driver changed the puncture on the short road section between stage 1 and 2. There was another two stages to complete before heading back for a midday service and they both were completed with no problems and had climbed back up to 17th. The afternoon had three more stages in store for the competitors. 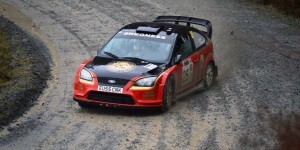 With the rain not easing off any, the stages were still very slippy with some parts having a lot of standing water. 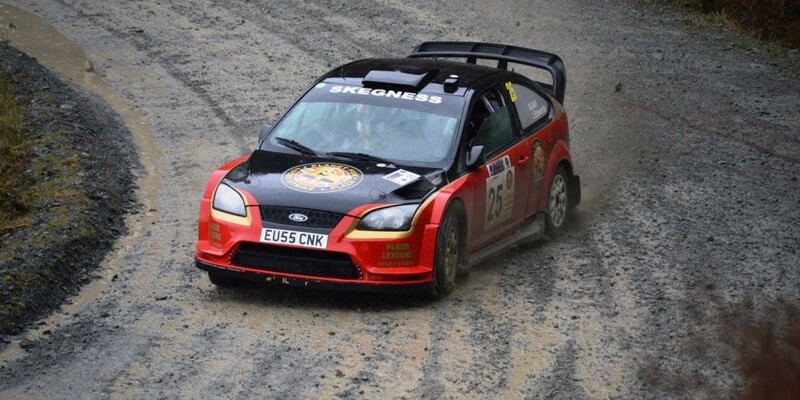 Three top 9 stage times saw Bell and Edwards climb up to finish a very good 11th overall which is up 14 on their seeding and considering the puncture the event turned out to be a good warm up for the teams first BTRDA round, Rally Somerset in just two weeks time.